Facing financial uncertainty is overwhelming. We’re here to help. Your first step, whether you need food, need to speak with a social worker or need resources for your children, is to call us at 952.888.9616. Volunteer operators will gather information and explain VEAP’s programs. VEAP’s call intake center closes at 4:30 p.m. on Mondays-Wednesdays, Fridays and 6:30 p.m. on Thursdays. 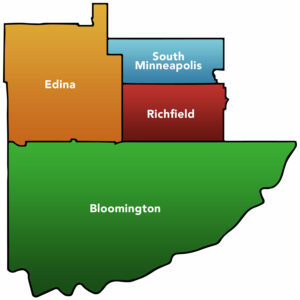 In order to access VEAP’s resources you must live in the area that includes Bloomington, Edina, Richfield and the portion of south Minneapolis that is west of Cedar Avenue and south of 50th Street. Food resources include a food pantry, food programs for children and youth, Nutrition Education and Teaching (NEAT) classes and food deliveries for seniors. VEAP offers caring, professional support to help you stabilize your housing and financial situation and create an individualized plan to access resources. You will work with a licensed social worker to identify the steps to take to reach and maintain financial stability. Transportation is one of the biggest barriers for individuals facing food insecurity. VEAP improves access to food resources for those with mobility barriers through food deliveries and pantry rides home. To ensure timely service for all clients, the Lobby doors will be locked at 4:30 p.m. on Monday, Tuesday, Wednesday, Friday and at 6:30 p.m. on Thursday.